Groundwater Sources Have Their Origins in the Water Cycle and Are Held in Aquifers Beneath the Ground Surface. 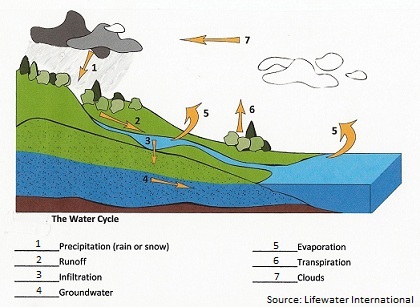 Groundwater sources have their origin in the water cycle and are held in aquifers beneath the ground surface. These aquifers can be penetrated by wells to provide a clean water source. Water that falls as precipitation flows along the surface of the ground. This surface water infiltrates into the ground surface and is held in soil pore spaces and in the fractures of rock formations. Gaining access to groundwater sources therefore requires digging or drilling through the ground and into an aquifer. An aquifer is a layer of earth material that is capable of yielding a useable quantity of water. The amount of water that an aquifer may yield is dependent upon the porosity and permeability of the material found in the earth layer. Sometimes people visualize groundwater sources as a lake or a river flowing underground. But, most commonly, groundwater occurs within the small pores between soil and sediment particles. Groundwater does flow, however. But, it moves at a very slow rate. Flow rates of ground water may range from 2 meters per day to 2 meters per year. The rate of groundwater movement depends upon the permeability of the material through which it flows. Groundwater flows from the area of infiltration, called the recharge area, to the discharge point. 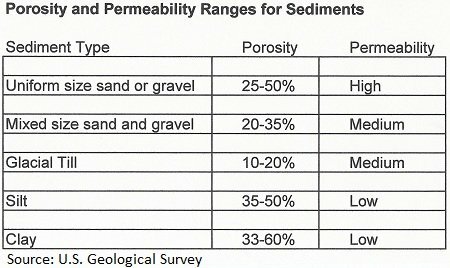 Porosity is a measure of the void spaces (pores) that exist between particles of clay, grains of sand, or pieces of gravel, in the layer. It is usually expressed as a fraction of the volume of void space divided by the total volume, and written as a percentage between 0–100%.Permeability refers to the ability of water to move between these pore spaces. As you can see in the table above, clay has high porosity and low permeability. Gravel, on the other hand, has a relatively low porosity and high permeability. Groundwater flows through the open spaces in sediment and rock. Layers that have high permeability allow water to move more freely between the pore spaces. Gravel layers yield more water because of their high permeability, so they make better groundwater sources than clay. Layers of bedrock can make acceptable groundwater sources if there are enough cracks in them and if those cracks are connected so that enough water flows through them to supply water to a well. A confining layer is a layer of sediment or rock which has low permeability. It does not allow water to easily pass through it, so it can protect the water beneath it from contamination. Water found beneath a confining layer is often clean water since it has the confining layer above it to keep out contamination. When an aquifer has a confining layer above and below it, it is referred to as a confined aquifer. The water within a confined aquifer can be under pressure. When a confined aquifer is tapped by a well, water can rise up above the top of the aquifer, sometimes rising above the surface of the ground. This is how an artesian well is formed. An unconfined aquifer is one that does not have a confining layer above it. The top of the saturation point in an unconfined aquifer is called thewater table. Pores below the water table are full of water. When tapped by a well, the water level in the well will be the same as the water level of the aquifer, since unconfined aquifers are not under pressure like confined aquifers are. Unconfined aquifers are found near the ground surface and are easily recharged. They have porous layers of sediment above them and may also be easily contaminated. A perched aquifer is a small unconfined aquifer that has a confining layer below it. There may be a larger aquifer beneath the impermeable layer that lies below the perched aquifer. Perched aquifers are not good groundwater sources because they do not provide much water and can easily be pumped dry or may go dry in the dry season. The depth that must be drilled in order to find water depends upon the type of aquifer and other factors. Water will be found when the depth of the borehole reaches the potentiometric surface. The potentiometric surface is the level to which groundwater will rise in a well. In an unconfined aquifer, the potentiometric surface will be at the same level as the water table. In a confined aquifer, the potentiometric surface will be higher than the water level in the aquifer, since the water in the aquifer is under pressure. The water level in the well will also be higher. The static water level has two definitions, one for unconfined aquifers, and one for confined aquifers. In an unconfined aquifer, it is the water level in a well when the pump is not operating. In a confined aquifer, the static water level can be defined as the level to which the water will rise in a well penetrating a confined aquifer that is not being pumped. The water table in a confined aquifer tends to rise during the rainy season and drop during the dry season. This seasonal fluctuation in water level can range from less than a meter to as much as 5 or 6 meters, depending on the amount of rainfall and how many trees draw water from the aquifer. Shallow unconfined aquifers will likely have greater seasonal fluctuation than deeper unconfined aquifers. Return to "Groundwater" from "Groundwater Sources"